We have all heard the line “I’m looking for an experienced doula” or “I am an experienced doula” but what does that mean? How does one become an “Experienced Doula”? This is not a simple question, I turned to my peers for answers. I questioned a few doulas that i consider experienced and then I sat back and reflected on why I contacted them. Why did I consider them experienced…. Basically it is not a set number of births or years in the field. Often this comes with the title “Experienced Doula” but there is so much more. I believe it’s a combination of attributes, skills and qualities. Some doulas will only have 30 births but they consume information. They talk birth often, they are up to date with information and once they know something they continue to do research that confirms this is in fact still current recommendations. Continuous learning and training is essential to be experienced. The other piece is the ability to sit back and simply be there for the birthing person. Sometimes “doing” isn’t always helpful. Birth often unfolds best when it is undisturbed. Informed choices (the backbone to RMDS). This is not as easy to execute as one might think. Ideally in prenatal visits an experienced doula will share the benefits and risks to their clients while not sharing their personal beliefs. Knowing the latest research is critical. Knowing the benefit of the latest research and the risk is equally important. Facilitating this in a birthing space is not easy. An experienced doula needs to confidently ask questions, kindly and tactfully remind nurses and care providers that their job is to provided informed choices EVERY TIME. Doulas often are intimidated, but if we are educated we will speak from that place and our clients will get the information they deserve. Another part that is often hard for doulas is not allowing your relationship with the care provider to come before your clients needs. It is their birth, and regardless if you align with them or their care provider aligns with them- birth is all about the birthing person, every choice, every single choice, every single time. The clients hired a doula and it is the clients’ RIGHT to accept or decline recommendations. An experienced doula’s job is to have their client’s back and to facilitate that discussion. 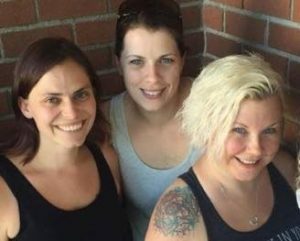 RMDS local team is a group of experienced doulas who are okay having crucial conversations, training often, always learning AAAAAND as a bonus we’ve been to over 200 births. Written with passion from RMDS doulas Nicole Chambers and Allison Farrance. A special thanks to Gina Snyder from Truly Pure Birth for taming this passion and skillfully adjusting the language of this blog post by containing this post with all of her…. well, experience.